Speculation about Rangi Chase being left out of Castleford Tigers’ squad to face Leeds Rhinos this Thursday has been confirmed with the Tigers now without two of their first choice half-backs for the big West Yorkshire derby at the Mend-A-Hose Jungle. A club statement said that Chase will not be available for Thursday night’s game and speaking today, Tigers chief executive Steve Gill said: “Rangi was part of an investigation that has been dealt with internally by the club. Daryl Powell’s 19-man squad to take on Leeds does include Paul McShane, back after suspension, while Will Maher, who has been on loan with Batley, is in his first squad of the season alongside new recruit Alex Foster. Chase, the injured Ben Roberts and Luke Million drop out from last week’s squad. Tickets are flying out for the big game ahead and fans are reminded to pre-purchase tickets to ensure they do not miss out on the action. More than 8,500 tickets have already been sold and the match could be a sell-out. Tickets are available to buy now from the Tigers Den club shop in Carlton Lanes or fans can buy via the Tigers online box office. Castleford Tigers’ squad is: 18. Matt Cook, 5. Greg Eden, 34. Alex Foster, 7. 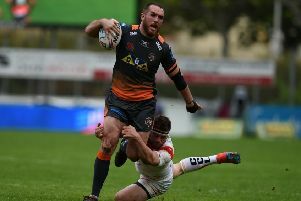 Luke Gale, 1. Zak Hardaker, 8. Andy Lynch, 22. Will Maher, 14. Nathan Massey, 9. Paul McShane, 12. Mike McMeeken, 10. Grant Millington, 13. Adam Milner, 2. Greg Minikin, 21. Joel Monaghan, 17. Junior Moors, 15. Jesse Sene-Lefao, 4. Michael Shenton, 19. Gadwin Springer, 3. Jake Webster.